Joyce Glasser reviews Force Majeure (April 10, 2015) Cert 15, 119 min. Force Majeure means ‘superior force,’ ‘unavoidable accidence’, or, in insurance parlance, an ‘act of God.’ In contract law force majeure frees both parties to the contract of liability. 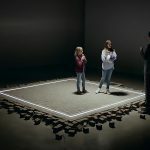 Swedish Writer/Director Ruben Östlund turns this legal concept into a dramatically compelling, beautifully shot and perfectly acted dark comedy that is unlike anything out there. A blond, healthy and affluent-looking Swedish family check into a luxury ski resort nestled precariously on a plateau in an Avalanche-prone mountain range in the Alps. The stunning Ebba (Lisa Loven Kongsli) reprimands her handsome husband Tomas (Johannes Kuhnke) about using his mobile phone for business calls. She reminds him (and informs us) that the five-day holiday was intended as rest for him and quality time together for the family. The film is divided into the five days with captions keeping count. This device breaks the fourth wall long enough for us to feel like witnesses to a clinical study of a family under the microscope. The weather is perfect, but everyone is conscious of the disconcerting sound of controlled avalanches, the resort’s way of preventing the real thing. On Day 2, after an enjoyable morning skiing, Ebba, Tomas and their children, Vera (Clara Wettergren), of primary school age and her younger brother Harry (Vincent Wettergren), enjoy lunch on the hotel restaurant’s scenic terrace. Suddenly they hear a loud noise and become aware of a massive snow drift descending on the terrace like the wave of a tsunami. Ebba shelters the children with her body while Tomas bolts off to safety. Within minutes, the crisis is over. The diners realise they are safe and the guests, including Tomas, return to their respective tables. While it seems the worst is over, for the family it is still to come. At first Ebba does not mention the incident, but it is clearly bothering her, particularly when Tomas refuses even to acknowledge that he panicked and abandoned his family. As Ebba begins to question their marriage, Tomas begins to question his manhood. His self-esteem is revived temporarily when two ski-bunnies flirt with him. His elation turns to humiliation when he learns that the compliments were intended for someone else. When Tomas’ old friend Mats (Kristofer Hivju) joins the family for dinner with his much younger girlfriend Fanni (Fanni Metelius), the tension mounts. During a show down, the children huddle in tears in a dark corner, fearing their parents will divorce. Meanwhile, that evening in their hotel room, Mats and Fanni are deeply affected by their host’s argument, and begin to question their own relationship. It is not surprising that this examination of human frailty and gender stereotypes won the Jury Prize in Un Certain Regard at Cannes and was short listed for the Foreign Language Academy Award. 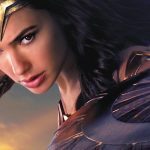 In addition to creating wonderful characters that are brought to life by the six lead actors, the film is a visual treat. Östlund used to make skiing films before turning to feature dramas, and it shows. 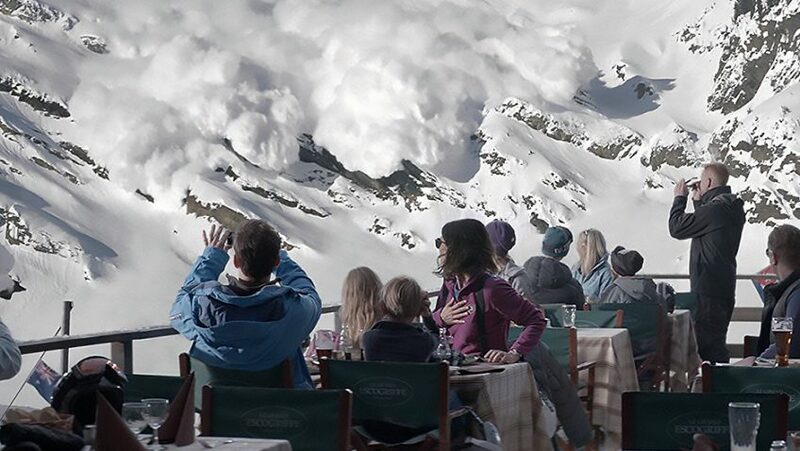 We might never know how he and cinematographer Fredrik Wenzel achieved the spectacular effect of the avalanche near the terrace, but the entire film is stylised in a compelling hyper-realist manner. Östlund avoids fast cutting and favours a cross between a close up and a medium shot. Only on the slopes do we sometimes see a long shot, but these are primarily background shots. It is as if Östlund wants us to become close to this family as Ebba and Tomas negotiate a way back to their normal roles and relationships. Perhaps we, like the disillusioned couple, are meant to ponder the question of whether force majeure can really free both parties of liability if the contract is marriage. Their solution is at once unexpected, clever and so subtly directed that Vera and Harry might not be the only ones to fall for the subterfuge. The humorous epilogue-like ending either takes the theme in a thought-provoking new direction or brings it back full circle.